Well that was an end-of-season crash and burn. Rachel Harvey & Annie Kennedy suspended from team for incident at Orono pizza place. Harvey & her father with a court date for incident.......WTF is in the water up there??? mainejeff wrote: Rachel Harvey & Annie Kennedy suspended from team for incident at Orono pizza place. Harvey & her father with a court date for incident.......WTF is in the water up there??? Orono police said Harvey and her father William were charged with assault and disorderly conduct Saturday evening around 10:45 when they were involved in a physical altercation with other patrons at the Orono House of Pizza. Police said an investigation into the incident is still ongoing, though both Rachel and William were each issued a court summons for the charges. The two were not arrested. Specific details of the incident were not made available because everything is still under police investigation, though no other patrons were charged following the altercation. Police also said the incident was not a domestic dispute. ....Defending tourney champ UMaine is the second seed and received a first-round bye in the double-elimination affair. The Black Bears will play the winner of Wednesday’s game between third seed Stony Brook and sixth seed Hartford on Thursday at 1:30. UMaine softball coach Mike Coutts said the suspensions are “unfortunate, especially this time of year. 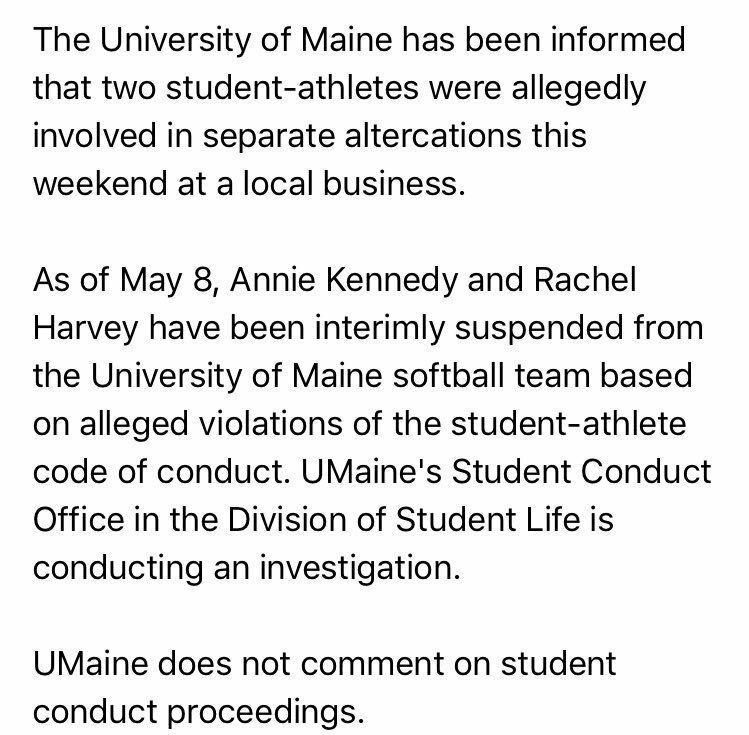 Two UMaine softball players were suspended Monday. Today, the rest of the team got on the bus heading to the conference tournament in Binghamton, New York. Two holes in the lineup, but the next player has to be ready to go.